Porter - Acrylic 11" x 14"
Here is the latest commission I just completed. This is another Pudelpointer named Porter. He belongs to a wonderful family in Wisconsin who says he is a great hunting dog as well as a loveable goof-ball. We decided on a montage type of portrait done in acrylic to best capture the essence that is Porter. Using photographs she sent me I was able to place Porter in a scene common to rural Wisconsin doing what this versatile hunting breed loves to do....point and hunt! 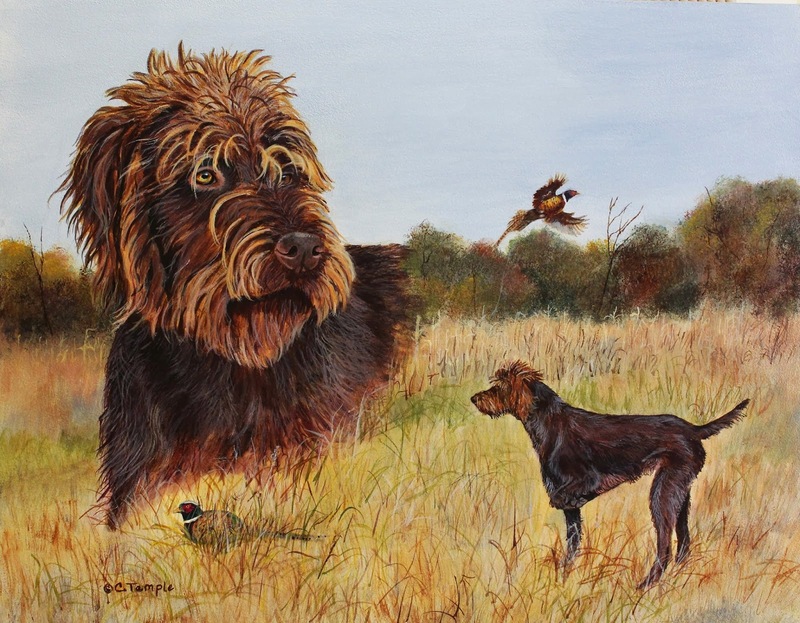 This is the third Pudelpointer I have had the privilege to paint. It's not a very common breed so I feel quite honored that these folks have sought me out to paint their beloved pets and I have found it to be a wonderful opportunity to get to know the breed better. It's my understanding that they are a very versatile breed for hunting waterfowl and upland game. What I have found most interesting about them is that their coat can vary considerably from being very smooth, to wiry and coarse and everything in between. They all seem to have whiskered faces, but even that can vary a lot. Snidely (here) and Porter have a lot of wild facial hair while Tukr (here), the first one I painted, had a more manicured look to him. I particularly enjoyed painting Porters "organized chaos" hairstyle. It looks like it might have taken just a few quick brushstrokes, but in reality it took several layers to get it to have the depth and wild look that Porter seems to be known for. Acrylic is a great medium for that as you can put down a layer and it dries quickly. I could then glaze over it with different colors and seal it with a gloss varnish to bring out the depth and highlights and keep working back and forth until I was satisfied with the results. Thanks again to Porters family for allowing me to create something special for you! Anyone else out there interested in a portrait of any breed or pet please check out my portrait page here for further info and contact me for a quote. I will be happy to create a special piece you will always treasure! 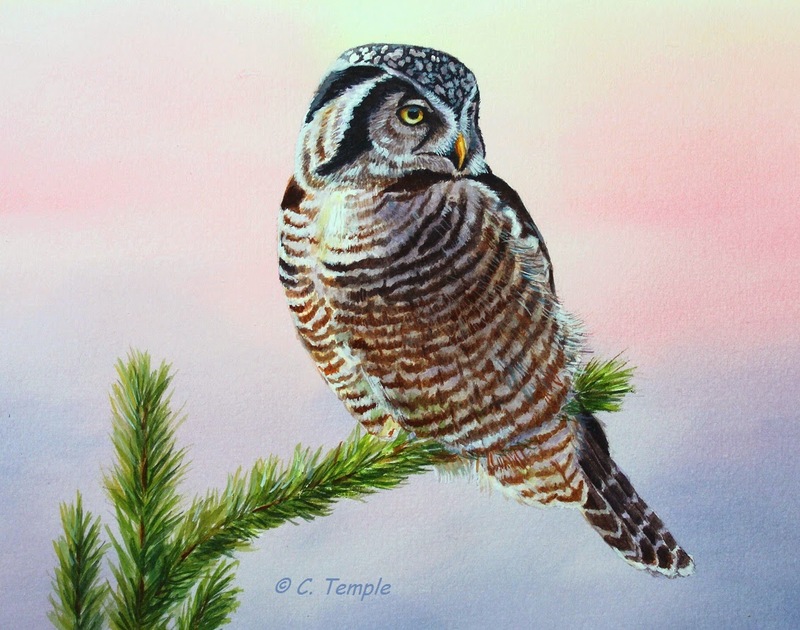 Northern Hawk Owl-watercolor-8" x 10"
Why is it that something that seems of little consequence to some can capture the hearts of others in such a way that it makes them drop everything and travel sometimes hundreds of miles to go see it? What causes some to be filled with such awe, wonder and delight? What can cause grown adults to behave as little children, speaking in animated, happy voices to perfect strangers as if they were closest friends? 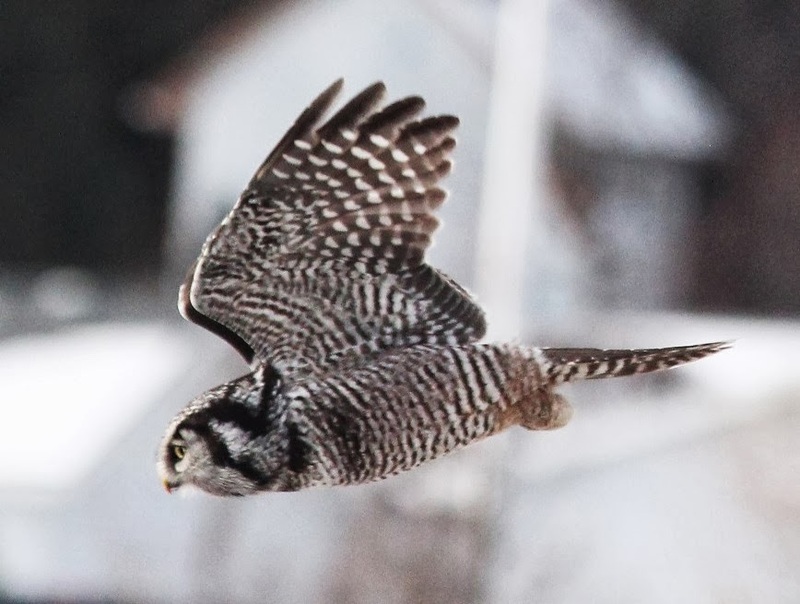 We had one of these “somethings” drop out of the sky in Moscow, Idaho around the first few days of December 2013 in the form of a bird called a Northern Hawk Owl. To some it was just another bird, passed by without notice. To others it was a rare, category 5 bird from the great north woods of Canada or Alaska, seldom seen by humans in the remote areas it normally inhabits. Yet here it was in a well-populated area along a busy highway and next to a shopping mall making it easily accessible for any who cared to look. This caused great excitement and great alarm as well. In the birding world, word spread quickly by phone, emails and rare bird alerts on the internet. Folks by the car load were heading to see it armed with spotting scopes, binoculars and cameras of every shape and size. The hawk owl seemed oblivious to the traffic, noise and celebrity status as it perched atop bare trees and entertained it’s observers by swooping into the grass and extracting a vole which it took to the top of a tall tree and voraciously devoured while cameras clicked away recording it’s every move. When I first saw the reports, I too, got very excited. This was a “life” bird for me and it was only a short drive from my home. Unfortunately, my schedule did not allow an immediate departure to see it so as days went by and reports kept coming I became anxious that I was going to miss a great, maybe once in a lifetime, opportunity. Finally, a break in the schedule allowed me my freedom and I grabbed camera, binos and sketchbook and drove like a maniac praying the whole way that the bird would stay put and grant me a viewing. I needn’t have worried as the hawk owl was content in its new found home. It was perched on a lamp post in plain view and as I approached it flew to a bare tree. It was clearly hunting so I kept my distance not wanting to scare it into the traffic that whizzed by just yards away. For a few moments it was just me and the owl and I took note of the size (smaller than I imagined), the coloring (interesting patterns of barring, stripes and spots) and when it turned, the pale yellow eyes fixed me with a fearsome gaze. Our moment together didn’t last long as other folks arrived with cameras and enormous lenses that, to me, could have photographed the bird from miles away. We discovered the owl was quite approachable and tolerated us as we all moved closer. It seemed to not notice us at all, but a moment later it launched from its perch right at us sending three men and a lady ducking for cover and scattering in every direction. Regaining our composure we relocated the owl behind us and jockeyed for position to get a better view. Then, for me, something magical happened. The hawk owl flew down and landed not more than 15 feet in front of us and perched on a mullein stalk. It sat there perfectly posed in the beautiful light of a winter afternoon and time and the other people seemed to melt away. I held my breath, scarcely believing my good luck, as I watched this wonderful bird through the lens of my camera. It paused for a few moments, its weight gently bending the stalk, then gave me that look again as if to say “step away from the voles and no one gets hurt” and continued to hunt. Mesmerized, I watched it carefully, waiting for the moment when it would spot its prey and pounce. When it did I was ready and tracked its flight down into the grass to capture the unseen vole. A moment later it was at the top of a tall pine tearing into its meal and the magic moment had passed. For the next seven weeks the owl graced us with its presence. Folks that lived nearby and could monitor its movements gave us daily reports and it looked like the owl was thriving. It continued to draw visitors from all over. 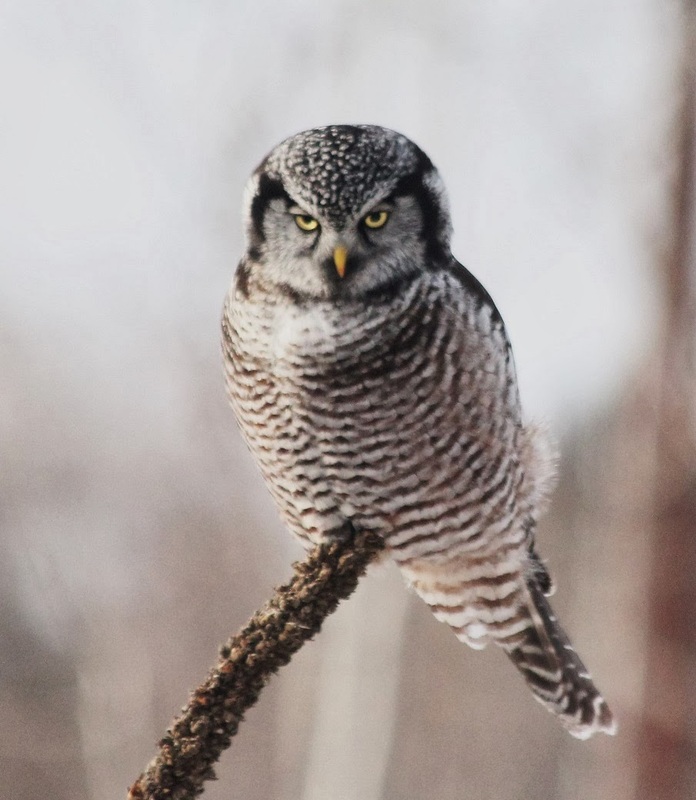 Then, on Jan. 16th, our worst fear happened and the Northern hawk owl was apparently hit by a car and killed. It broke my heart to hear of it leaving us in this way. It would have been better if one day it decided it was time to fly back north and continue to live its life there. I would have missed it, but it would have made me feel good about its going. Still, I feel so blessed to have been able to observe it and have the encounter I did with it. Those few moments being so close to this wild creature inspired me to create a very special painting and I am humbled that so many folks were as delighted with it as with the bird itself. What a rare gift this has been. My life feels fuller and richer for the experience and I feel a great emptiness at its passing.